I’ve got some preliminary measurement data back on several trees with Graybill tags in digital form. The dendro lab is working on cross-dating this week. The measurement data for our Tree #31 (Graybill 84-56), which Pete Holzmann posted a picture of earlier today, is very interesting. This is a strip-bark tree – remember that the NAS Panel said that strip bark trees should be avoided, a policy then disregarded in recent paleoclimate studies (Osborn and Briffa 2006; Hegerl et al 2007; anything by Mann and/or Rutherford; and, of course; Juckes et al 2007). Let’s look at some details of Tree 31 keeping strip barking in mind. Here is a graph showing the measurement data for cores 31A (from the west) and 31B (from the southwest) for a tree that is strip-barked on the south. The dashed line shows the average ring width for all Almagre cores. There is obviously a fantastic difference between ring widths here for cores taken only 45 degrees apart: W vs SW. The maximum growth in Core 31A was in 1915 – not known as a “warm” year – when growth in the W core was about 3.7 times as much as the average for the site. Here’s Pete’s picture of Tree 31. Tree 31 (Graybill 84-56) was sampled from the western trunk. The tree itself has TWO elongated oval trunks (split at the base). The western trunk of Tree 31 has a distinctly oval shape – it is more than two feet in one direction, less than one foot in the other. Both the south and north sides are stripped – Pete observes that you can see this at the picture gallery using the magnifying glass feature. As a preliminary interpretation, perhaps strip barking occurred in the early 19th century leading to the elliptical growth shown here. At present, we lack a concordance to the Graybill archive numbers. I’ve experimented with various permutations and have some guesses, using the assumption that the order in the archive is consistent with the order of the tags (although it need not be.) Here is one possible overlap of the Graybill archive (ALM19 here) with our samples (match done impressionistically considering the length of the records, the “coherence” and order in the sequence of numbers. Of the 23 trees archived from Graybill’s 1983 samples, only 2 had more than one core. ALM19 had only one core – one presumes that it was drilled at the opposite side to the stripping. Cores from Tree 31 (black,red) taken in 2007, compared with Graybill ALM191. One of the possible benefits of coming at this enterprise from outside is that you think about operations and calculations that dendroclimatologists don’t think about. For example, here, it is daunting to think about what kind of statistical model is needed to cope with this kind of situation. And by thinking about it, I don’t mean merely a shrill declaration that there is nothing useful – something that many readers do far more quickly than I do – there may be nothing usable, but the data is still interesting. Plus from a mathematical point of view or a crossword puzzle point of view, it doesn’t really matter whether it’s usable, it’s still interesting data. , where is the ring width of tree i in year j, are parameters for each tree. Now let’s suppose that you try to fit a model like this to the above cores – using ARSTAN or nlme. What happens? Well, first of all, you can’t get the negative exponential age curves to fit. What happens is that the iteration fails after a certain number of attempts and ARSTAN seems to assign a mean value in the above situation (there is also a possible assignment of a negative linear slope, but I haven’t figured out how it gets triggered in ARSTAN). For the purposes of the residuals, it really doesn’t matter whether you calculate residuals from a horizontal straight line (or from a negative exponential or any variation of such curves.) For Core 31A, you are going to have unbelievably huge residuals from any sort of model of a ARSTAN type – not only that, but the residuals are going to be unbelievably autocorrelated. The reason is obvious when you think about it – the ARSTAN type model does not model for wows in the shape of the tree from whatever is happening on the opposite side of the strip bark. This is even more so for RCS. Just looking at the above curves – how can one establish with any certainty that the sort of skew introduced by the elliptical strip barking is canceling out? You can’t. Especially if the problem isn’t addressed squarely. If you look at the older dendro literature (even in things by Cook in the 1980s), you see much more use of “flexible” splines to fit curves like this. They were thinking of problems in canopy forests where trees can have pulses that look sort of like Core 31A. If you fit a cubic spline to these sorts of curves, you can get rid of this sort of pulse and recover the high-frequency information that is relevant to dating applications. As long as dendrochronologists were using tree cores as a service industry for other disciplines (dating Navajo pueblos or such), the ability to recover centennial scale change was irrelevant. But once climate change became the customer, then they had to modify methods to try to recover centennial-scale change and the techniques previously used to mitigate things like Core 31A were thrown out the window. One sees the development of Jacoby’s (“conservative” standardization) and Briffa-Esper “RCS” standardization which now rule the roost. Of course, none of these people worry about, and perhaps don’t even think about the hugely autocorrelated residuals or whether the residuals may point to problems. Let’s try to posit our own model for Core 31A. What does it really mean when we talk about residuals here as a type of “error”? Yeah, there are “errors” in measurement, but that’s not really the issue. The issue is how to describe the elliptical stage of Core 31A relative to Core 31B. Or – and I’m pondering this – are we de facto modeling the reaction of a “standard” “adult” tree? And thus need to model the difference of Core 31A from a “standard adult” tree as a type of pulse with a scale of 100 years, with potentially a huge amplitude in the pulse. In this way of speaking (and I’m not sure whether this will prove useful), when a Core 31 A goes elliptical, some way needs to be figured out whereby it can be adjusted back to a “standard” tree. In this case, I don’t think that the thick rings of Core 31A in 1915 necessarily indicate fantastic growth, although perhaps they do. It doesn’t seem to make sense that the tree as a whole was somehow growing at nearly 4 times the rate of the a “standard” Almagre tree. I don’t think that “autocorrelation” models necessarily describe the effect very well – it looks to me more like a pulse lasting nearly a century in which Core 31A is a dilation of Core 31B. How one would go about estimating the pulse and adjusting for it – I have no idea. But surely this is the sort of thing that practitioners need to be thinking about. If such pulses were somehow included in the model as some sort of random effect as a way of achieving an “honest” error estimate, it may get very hard to pick up a temperature signal. If we find that dilation on the opposite side of strip bark is characteristic (as seems highly probable), then there may be a much simpler explanation of the 20th century trend in strip bark chronologies (reported by Graybill and Idso 1993; confirmed by Ababneh). It may have nothing to do with CO2 fertilization or any other fertilization and be nothing more than a mechanical effect from the strip barking itself. We know that Graybill went around looking for strip bark trees ( we know this because he said so!) 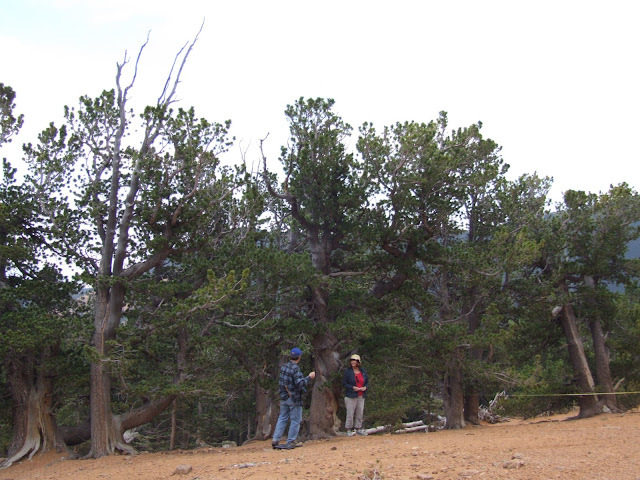 We know that the strip bark trees constitute Mann’s PC1 (and are essential to his reconstruction.) The NAS panel said that strip bark trees should be avoided but didn’t really explain why other than possible CO2 fertilization or phosphate fertilization. In our own articles, we didn’t rely on any particular explanation of the problem with these trees – our position was more that it didn’t make any sense that climate history should depend on results from one researcher on one type of tree, about which there were many warnings. In Ababneh’s thesis, her chronologies for whole bark trees – even in the Mannian “sweet spot” of Sheep Mountain CA – didn’t have any remarkable HS. To recap, I’m wondering if the issue is completely different from CO2 fertilization or such and something as “simple” as strip-barking itself. In this light, one would have to watch out not simply for strip bark, but for problems resulting from elliptical growth – warnings would perhaps come from growth excursions of older trees at well above population means. Update: I looked at Pete’s Excel spreadsheet and, from the Graybill tagged trees, picked the two trees where the notes contrasted most i.e. Tree 47 was described as “mostly whole bark” while Tree 37 was described as “strip bark, hollow”. Now look at two ring widths plot that I have on hand (and I’ve only got measurements for about 7 trees so far). You should be able to guess which tree is whole bark and which tree is strip bark. Yes, on the left is Tree 47 which arguably has the sort of negative exponential growth curve presumed in tree ring studies. On the right is the strip bark tree. This would make a very strong impact on a tree ring chronology. So again the biggest effect in Tree 37 is entirely nonclimatic. This entry was written by Stephen McIntyre, posted on Oct 17, 2007 at 7:29 PM, filed under Almagre and tagged almagre, strip bark. Bookmark the permalink. Follow any comments here with the RSS feed for this post. Both comments and trackbacks are currently closed. Well, someone on Annan’s blog said he wanted to see McIntyre get out there and core some trees. Those who the Gods wish to destroy, they grant their wishes! One other interesting thing about these strip bark growth pulses – remember Mann’s claim that these trees were teleconnecting to global climate – that they were not simply thermometers, but thermometers capable of integrating world temperature. It would be ironic if they were simply reaction wood from the strip barking itself. Seems more likely, doesn;t it. I inadvertently just overwrote this post with a half-written version. If anyone happens to have a feed of the original post, I’d appreciate it. I’m wondering what is this “strip-barking” procedure? For what purpose and how deep the bark was stripped? If the barking was done only in the dead parts of the bark then there is no harm done. But, as far as the description says, the barking was done to the living parts of the wood tissue, thus the damaged trunks. Could someone little bit lighten up this barking matter? J – it’s not a procedure, it’s just a description. Presumably because they are so long-lived, many of these trees have sustained damage to segments of their outside that has killed the cambium there. Thus, the trees’ living “bark” remains only in “strips”. OK, so it has been caused by the natural phenomenons, like fire and wind. I thought that it was made by humans for some reason in the past. Steve McI #2 – your Occam’s Razor explanation makes a whole lot more sense than Mann’s magic trees. I am looking forward to the (I imagine) forthcoming paper…..although some will find someway to ignore it. Jonde> …caused by the natural phenomenons, like fire and wind. Lighting seemed to be the cause for some trees on my property here in Colorado. there would be a high number of stripped trees. Just an observation. It may have nothing to do with CO2 fertilization or any other fertilization and be nothing more than a mechanical effect from the strip barking itself. I seem to remember a long ago post where this sort of thing was discussed. It even included a link to a picture of Mann himself showing off a polished cross section of a tree that very clearly showed highly non-uniform distortion of the rings as one went around the circumference of the of the slice. This would make a very strong impact on a tree ring chronology. So again the biggest effect in Tree 47 is entirely nonclimatic. That should read “Tree 37, no?” Very interesting, as usual! That makes me wonder whether you can verify that the bark was stripped just before the rise in ring size? If you could sample the “dead” material and match the chronology up with the still growing part of the trunk, wouldn’t it tell you exactly when the damage occurred? Of course this presumes the dead part can be sampled without it falling apart. Surely trees are basically asymetric, ie a tendancy to grow more in one direction that another, and either the coring needs to be directed in a particular direction (selection), or a very large number of cores in random directions are needed? Also tree 31 looks half dead. Was it struck by lightning? Why would Graybill choose such a tree. Surely a long life in one piece would be a basic requirement. I’m shocked. I’ll look at the othe photos later. Would not go so far as #1, “Gods destroy”. This work needs to be done to show error magnitudes and possibly prior glossed-over assumptions. I have never worked on BCP so this is about trees in general. Random comments. A compass might not help. Many trees rotate as they elongate, some by radians. The photo of the tree that looks split. I have seen 500-year old dead trees with 50 year suckers growing from the base. You might have to search a long time span to find a match. Even then, the “main” tree could have been a sucker too. One cause of bark stripping is loss of a branch. If the branch is small, the bark can grow over the wound and you might not see it. How far is your core from a blatant or a subtle knot? If the lost branch is large and even distant, the whole equilibrium of the tree is upset. How far from a lost brach should you sample? Don’t know, would expect a foot or two to get a vinyl disc result. After losing a major branch, the whole tree has different light conditions, different competition from neighbours, more chance of insects, rot, etc, the drip line can change and the nutrient soil supply alter. The cambium can thicken or thin in diverse ways to correct the situation, even though you are sampling what seems to be a pristine spot. The main area of importance to me is below ground, with the root system. That is the source of most nutrition, hence tree ring widths. Without the facility to imagine past root conditions, the tree ring widths have a large noise component that has to make mathematical analysis only semi-quantative. Roots can get fungal infections, land slips, erosional exposure and other such obvious effects. Tree ring variation is confounded with so many other unknowns that it has to be a poor predictor for climate particularly temperature, especially global. Plant growth hormones like auxins can be peculiar. One plant I know makes a 30 degree kink at each leaf node, first left, then right, or vice versa. Reason unknown, but fun for bonsai lovers. I would hate to have to reasearch an understanding of auxin what fors and how. Finally, some plants add new branches at a rotational angle of 137.50776 degrees (this is a computer-modelled number, hence far more quotable than the measured one). Thus, the trunk has a “memory” function that predicts this angle, which can be reliably related to one of the common Fibonacci number series. This has little to do with dendrochronology, but I added it because it is spooky and might add to the interest of reader/authors with a paranormal bent, not unaligned with some of the dendro papers I have read. Hehee…that’s why you need to standardize, detrend, average and do all the other hocus pocus statistical methods and even then cherry pick the data to get out even some sort of common signal from the tree rings. But, it’s interesting to see what Steve and Pete can do. Strip barking is a condition that is caused by partial cambial dieback. It can refer to a tree where the cambium has died leaving a strip of exposed wood that extends from a dead branch down to a dead root or to the condition when all of the cambium has died leaving only a thin strip of live bark that extends from one live branch down to one live root. This condition is most common on very old trees. The factors that cause the initial partial cambial dieback and the benefits of this growth form to survival are still being studied by scientists. For pictures and diagrams, follow the link. Also tree 31 looks half dead. Was it struck by lightning? Don’t know for sure, but that would be a good guess. The reason we didn’t core all the trees we found with Graybill’s tags was the huge lightning storm that was approaching much too close for comfort. Most likely, many of these strip bark trees have encountered many lightning strikes. We also have seen many (large!) fallen trees — which would easily “strip” nearby trees of many branches. Or, how about a major hail storm? In August, we endured a hail storm with many golf ball (3cm) size hail stones, and quite a few billiard ball (5-6cm) hail stones. I guarantee, that stripped many trees of their greenery, as well as some branches. To say nothing of the 16 inches of (small-stoned) hail that fell a few years ago. Why would Graybill choose such a tree. Surely a long life in one piece would be a basic requirement. Im shocked. It depends on the purpose of your study. If you are a dendrochronologist who simply wants to know how old the tree is, there’s no problem at all. Coring the oldest trees typically involves trees that have survived many damaging events over the years. There’s a lot of valuable things to be learned from such study. After all, how do we learn about reaction growth (without killing the tree)? We take core samples. On the other hand, certain other scientific disciplines have taken the same data and used it for unusual study purposes. As Pat Frank likes to point out, developing an hypothesis about the meaning of a data series could be considered rather non-scientific if one has no clue about the underlying physical processes involved. Steve McIntyre’s a statistician with some experience in the connection between data and physical reality, so he started digging when he saw data shenanigans going on. A few others have concurred, but mostly the scientific community has been ignoring the issue, even though there just might be serious global policy implications at stake. Even without seeing the tree ring data yet, I’m happy with the results of our little adventure. More input is coming from people with forestry and biology expertise, and we have a good bit of data to support response to their questions and assertions. Leslie H just returned from her travels, and emphasized to me that the data provenance she collected really is a minimal amount of information. She spent only a few minutes per tree, capturing site data and taking all those photos. She’s happy just to be using some of her training; and remember, we are not experts in tree growth. Yes, Leslie has a variety of naturalist/bio/etc experience, and has a passion for the scientific method (having taught science to kids). But she’s not a forestry expert: didn’t know details about reaction growth, auxins and such. So we were just trying to do a generally good job of recording good data and collecting a variety of good and interesting samples. Biologists would normally study these trees far more intensely before drawing any conclusions about their growth — today or over the centuries. For example, The paper Jonde linked to in another posting is quite interesting. I am wondering if for proper teleconnection signaling that there should be a branch nearby to use as a antenna to receive the entire global temperature data stream. Dendrochronologists (dendroclimatologists at least) normally never measure through reaction wood. So if you have samples that show reaction wood either measure around these areas (if you have a disk) or do not measure the sample. This is not cherry picking  it is common sense. I think youre a little confused with names of software. By default COFECHA uses a 32 year spline  that will effectively remove all the longer term pulses you are describing. However, I think you are actually talking about ARSTAN. That is the software most dendrochronologists use for detrending. A general comment to everyone: trees are not thermometers or rain gages. They are inherently noisy and that is why we sample multiple trees per site and ideally multiple sites within a region. Focusing on the detrending of one tree is really not that interesting or meaningful. I will admit that it can be very educational (and scary) to undertake interactive detrending of individual trees, but it is ultimately the final chronology that is of real interest. Focus on the difference between strip bark and non-strip chronologies. That is what is interesting here. Lastly, lets not forget that TR based reconstructions of NH temperatures exist that do not use Bristlecone pine or Foxtail data. #18… So…. There he is … our AGW Lord of the Rings. I’m not convinced it’s time to head to the hills in panic, ahead of the rising waters and your site offers a cool head in a heated area of debate. You (and your regular bloggers) sometimes put a welcome smirk on a subject taken way too seriously by “Warmmongers” and the political elite who have taken up the shield to protect us from ourselves. I’m not to up on the physics yet but I’m a quick learner and would like to put some questions to the forum. Hopefully I’ll have some new angles to that will raise other questions, or not. Even if bristlecone pine and foxtail data were acceptable, how representative and accurate would “multiple trees per site” at this number of sites http://www.ncdc.noaa.gov/paleo/pubs/mann2003b/mann2003b.html truly represent NH temperatures? 1) Since times that are too hot and times that are too cold both produce narrow tree rings, how do you differentiate between the two? b) is it just assumed that these are all gaussian normal noise that averages out? 3) If the answer is “b, they are gaussian normal noise”, are there any studies that show that this is the case? 4) The variation in width of a single ring is clearly visible in the photo above. While an average ring width can be determined by averaging the width of the ring around its circumference, how is this handled when the tree is cored? Or is this also assumed to be gaussian normal noise? If it is assumed to be noise, are there studies that show that it is gaussian normal? Any pointers to places in the literature where these questions are answered would be greatly appreciated. Again, your contributions here are always welcome. Dendrochronologists (dendroclimatologists at least) normally never measure through reaction wood. So if you have samples that show reaction wood either measure around these areas (if you have a disk) or do not measure the sample. This certainly makes sense. But I don’t understand how they reliably avoid this problem? Obviously, for these old BCP’s, nobody in their right mind would have a disk. So you can’t see the reaction wood that way. And we’ve seen that many of these data sets involve trees from which only one core was taken. If more than one core is taken around the circumference, one can (at least at random) see the assymetry of reaction wood. So, how do dendroclimatologists reliably avoid using data from reaction wood when the tree has only a single core taken? Great Pic Willis in #18. … it is extremely obvious that we cannot use these tree ring widths at all to determine past temperatures. Besides the other issues of the fact that trees respond to ALL growing conditions not just temperature conditions, it is clear these tree rings are not symmetric enough to give reliable indicators. Congratulations Steve. As a forest ecologist I would suggest that you are very much on the right track. Rob Wilson suggests that one should not sample reaction wood. Indeed. But if people have used data from strip-barked trees, then they almost certainly got some cores with reaction wood, which would have a huge “growth spurt” that would bias even a multi-tree average. Thus what one should do and what data have made it into the data bases that people are using are two different things. then, when principal components or cherry picking amplify the “good” signal of trees that show a reaction to 20th century warming, one gets a huge bias from a very few trees. When you are taking just a core, how do you determine what is reaction wood, what is wood that is responding to strip barking, and wood that is good? Rob Wilson: A general comment to everyone: trees are not thermometers or rain gages. They are inherently noisy and that is why we sample multiple trees per site and ideally multiple sites within a region. Focusing on the detrending of one tree is really not that interesting or meaningful. I will admit that it can be very educational (and scary) to undertake interactive detrending of individual trees, but it is ultimately the final chronology that is of real interest. Dr. Wilson, is it correct to say that from your viewpoint, a “climate signal antenna” (if one chooses to call it such) is a not any single tree, but a network of trees distributed regionally and perhaps even globally. It seems to me that one implication of this viewpoint is that if Steve wants truly useful updated information on the use tree rings as proxies — using the original trees (or trees located very close to them) as the source of the updated information — and if no one else will support the effort, then he has to visit every last tree ring location and do it all himself. Is this a fair analysis of the situation? If it is, then perhaps Anthony Watts can marshall another group of volunteers to get the work done for Steve. 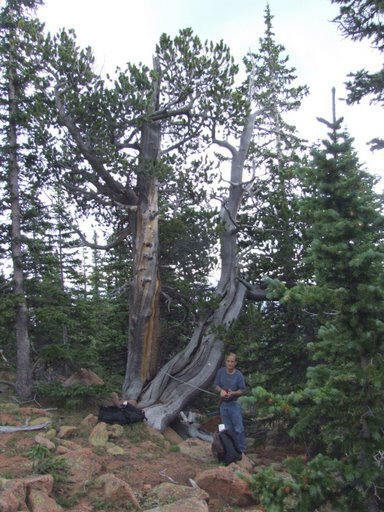 From SteveSadlow: http://natureali.org/bristlecone.htm , #21 of “Almagre: The Graybill Photos” and alluded to in #15 by GSherrington, the BCP appears to be one of the spiral conifers. The best picture of this was an article posted on CA that showed how they counted the rings then moved radially down the ring to start counting again. (on a low bandwidth computer and can’t find it easily, but it showed someone counting BCP, and the spiral was obviuos in the explanation of how to count BCP’s)You can see in the pictures at the ali.org the spiralling in the dead or near dead trees. What may not be obviuos, is that in many species one can see the branches or knots in dead trees spiraling up the trunk. I am familiar with a US southeastern pine species which I helped get samples with my brother when he was working on his master’s degree in biology. The point is, has this effect been somehow addressed in these dendroclimatologist’s work? As GS mentioned, what effect would a dead branch have not only on growth, but on the spiral? What effect does this spiraling have on strip bark trees? Is there a measurement or chronological series of pictures that show whether the strip stays on one side, or does it spiral around. If it doesn’t spiral around, then aren’t SBT’s and their tree-rings fundamentally different from a healthy tree and its tree-rings? A general comment to everyone: trees are not thermometers or rain gages. They are inherently noisy and that is why we sample multiple trees per site and ideally multiple sites within a region. Why is that important unless you are trying to find a local or regional temperature signal? How do you square this with the stated methods of many dendroclimatologists, that they take cores from many trees, then throw out all the ones that don’t have the pattern that they are looking for? Obviously “wood that is good” is wood that can show some sort of correlation with the hypotheses of warm-mongering. In the “neo-science” world correlation, any correlation is proof. and record GPS or map locations so that future generations can update the work? This might be a shot in the dark, but is it possible that bark stripping might partially be attributable to bear activity (or, to a lesser extent, big cats)? I heard somewhere that a grizzly will eat anything but granite. In conifers it is called compression wood. Compression wood forms below the bent part, pushing it up. Compression wood is rich in lignin. So if this is correct, you could determine the lignin content, and if it’s elevated, that would tell you that it’s compression (reaction) wood. There’s plenty of evidence that people will do stupid things to priceless natural features. Serious questions: to what extent should the actual location of old trees be protected? (a particularly challenging question for trees located on public lands that people use for weekend recreation.) And, what manner of protection is appropriate? My initial sense is one of fatherly concern. Then I realize that dumb people just might cut down a tree because it is handy, and not even know the significance of their action. Several of Graybill’s trees are located around a clearing that has obviously been used as a camp site. Somebody nailed together a latrine and attached it to a BCP. Another (20 inch diam) BCP was cut down with a chain saw and apparently used for firewood. Hiding the data won’t help with such stupidity. Will putting a latrine next to a BCP affect tree ring growth? It seems pretty clear that Graybill measured the very wow-ed wood on the opposite side of strip bark trees. Whether you call this “reaction wood” or something else is not the point. Whether it is something that dendros “normally” do is not at issue – it appears certain that this is what Graybill did – and these are “essential” for the Mannian reconstruction. I did mean ARSTAN (Corrected), but the point itself is valid. Rob, as you know, I believe in working through the details. In making a final chronology, you are assuming that you know the error structure. But if the average of relatively small BCP samples includes even a small proportion of wow-ed strip bark samples, it will have a substantial impact on the average. If the same method is applied over and over (e.g. all the Graybill sites that have not been updated), then the problem doesn’t disappear with averaging. Yes and no. That’s one issue. Ababneh (Still unpublished) shows a material difference between strip-bark and non-stripbark chronologies at Sheep Mountain (and doesn’t even show the Graybill chronology used by Mann and others that is off the charts). The Ababneh non-stripbark chronogies do not show a HS. Rob, there is a disproportionate use of bristlecone/foxtail data in the reconstructions – as you well know. Juckes (of which Esper and Briffa are coauthors) use 2 foxtail chrons out of 13; Osborn and Briffa used Mann’s PC1 and a foxtail out of 12 or so; Esper 2002 used 2 foxtails; Hegerl used foxtails and Mann’s PC1. So millennial reconstructions are addicted to these things – this might have been Mann’s greatest “contribution” to the field – he was the first person to apply these chrons despite prior warnings by specialists. The only chrons that do not use them are the two closely related networks: Briffa 2000 and D’Arrigo 2006. In both cases, you get different medieval-modern relationships if you use the Polar Urals Update rather than Briffa’s Yamal version. So neither of these recons can even survive a small decision like which chronology to use. In addition, the Jacoby Mongolia site used in both really warrants some close examination as there are some very odd growth spurts in individual trees. 2.- statistical filtering of the data . He was unable to explain me the exact “filtering”. The point I emphasize is they do not question at all the tools they’re using. If COFECHA uses splines or any other method for smoothing is something they don’t care. Yeah, and all of them rely on qualitative judgments of temperature limitation, from which quantitative temperatures are extracted. False precision, Rob. Dendrothermometry is not only rife with false precision, the entire field rests upon it; requires it for survival. That will be true so long as there is no quantitative (i.e., math-expressed) theory relating tree rings to temperature. Working out a C-13 kinetics approach would do it, but that would be long-term hard work, wouldn’t it. No press releases in that lot. When I read #20, I just sat back and imagined all that could be done to slice and dice such a set of data to produce a hockey stick. Bullseye. It was mysterious to me until Mr. McINtyre wrote yesterday “opposite side.” Aahh, I’ve seen this myself with ficus trees on curbless residential streets meeting negligently driven vehicles (not me! Any of the times!) Cambium disturbed on one side, other side takes up the slack, and thereby lays down more wood. Am I to believe this explanation never occured to the bristelcone dendrists? Steve, I would like to make an observation here as an engineer, a non scientist and non biologist. Isn’t the implicit assumption in determining the growth of trees based that regardless the age of the tree, it will grow forever at the same rate until cut down or burnt or diseased??? Why would one assume a tree grows at the same rate at the beginning, midlife and senior life? It seems to me teasing out the temperature or rainfall based on the width of the ring is an assumption of a constant rate of growth throughout a tree’s life without any regard to what stage of life it is in. Do we know for a fact that any tree if it had the exact same conditions year after year would actually produce the exact same size rings each year? Any experiments done to verify this implicit assumption through the life cycle of a tree species? I would think a tree company like Georgia Pacific or Weyerhauser would have this information. Maybe dendrology already factors this in, but reading all your comments I see no such acknowledgement or adjustment. The other point I would like to make is that a tree that has it’s bark stripped will obviously grow at a different rate in response to the “wound” inflicted on the tree. So looking at your example of tree 37 and 47, tree 37 is growing in response to the wound and tree 47 being the “normal healthy” tree is growing less as time goes by in response to it’s age. One could interpret tree 47’s rate of growth as response to normal aging. Isn’t it plausible that the rapid growth in tree 37 is simply an inherant survival strategy of wounded trees? Or even just unique to the species? Is it plausible that the various size rings each year in the same tree actually represent the wind speed as pressure applied on the tree over the course of the year? That the maximum pressure is a result of both weather and the amount of leaves on the tree giving the wind more leverage on the tree and as a result of more surface area the tree needs to thicken up to remain standing based on the experience of that year? As a fellow engineer, but one who (I think) has been following this a little longer than you have, I’ll take a stab at answering your question. No, there is not an assumption that a tree will lay down uniform-width rings over its age under constant environmental conditions. It is very widely agreed that ring width will generally decrease with age, other things being equal. So to back out the effect of other conditions, it is necessary to “detrend” the data for tree age first. From what I can tell, the most common fit for this detrending in a negative exponential. Read Steve’s equation and accompanying verbiage above closely. He is trying to fit the data to an equation that includes the negative exponential term for this detrending purpose. Of course, how successful this model, or any model, is in this case — or in general — is very open to debate IMHO. If you go through the archives of this site, there are many posts that touch on this subject. May I ask a few clarifying questions? If answers to them are above, or in the Abadneh thesis, I can only say I’m still reading both. When you speak of Core 31A “going elliptical”, I’m picturing a vertical cross-section of the tree with the side still possessing the vertical swatch, the “strip (of) bark”, exhibiting the greatest amount of growth. The strip bark condition is created by extremes of climate, including as pointed out above, lightning strikes and wind. 1. Given that these are limiting factors to “regular”, i.e. symmetrical growth rings, why don’t dendrochronologists select other trees? 2. What do (you) mean when you speak of “dilation on the opposite side”? Why should this be expected? 3. Are you suggesting that the strip-bark trees are deliberately being selected for chronologies for their skewed growth signals? Is it plausible that the various size rings each year in the same tree actually represent the wind speed as pressure applied on the tree over the course of the year? I would venture to say that with the girth of the trees useful for longterm climate study, wind has not been for a long time a factor for growth at the places cored. Where you don’t have a closed canopy as in the case of BCPs then the situation is somewhat different. But, OTOH, I’m not the one claiming BCPs are a good temperature proxy so I’ll not try working out the details just now. If by “noise” you mean subject to random error, this statement is incomplete, to the point of being misleading. Sometimes errors are unbiased in a particular direction. However this is not the case when the underlying statistical model has been specified incorrectly. I’ve said it before, but you force me to say it again. Do Front Range samples need to be redone? Has this most recent sampling been ruined by reaction wood? Since a strip-bark BCP is already half-dead, it will be the first to die when there is a second traumatic event — a drought or another lightning strike. Therefore strip-barks must on average have been stripped in the relatively recent past: in BCP-years, perhaps the past century. If, then, per #28, 41, 44, 45, they undergo a subsequent growth spurt in their remaining bark — perhaps because all the root is feeding only half the tree, or because competing limbs have been broken off or adjacent trees have fallen — strip-barks will, on average, exhibit a Hockey Stick like #37 in Steve’s original post above. Therefore strip-barks must on average have been stripped in the relatively recent past: in BCP-years, perhaps the past century. Indeed, strip bark reaction growth is remarkably similar to a lethal tumor. IMHO Nothing to do with climate. I know little enough about this to get me into trouble with experts. A tree does not grow at a constant rate, whether measured by weight, height increase, canopy spread or whatever. (Evergreens do not have the same growth cycles as annuals, etc.) The tree rate of growth slows with maturity in the sense that few of the above continue to increase. Then it starts to decay and emit CO2, a period we’ll not discuss here. (A rider is that carbon trading schemes that involve forestry trade-offs are valid only if the mass of vegetation per unit area is permanently increased, with a few trivial exceptions. Biomass fuel is a pipe dream). Leaving aside mass gains from photosynthesis and dust fertilisation and bird droppings and SO2 from various sources and CO2 fertilisation, the main path to tree growth is through the cambium layer, a thin case around the trunk and branches under the protective bark. Liquid nutrients taken up by the roots travel through the cambium layer and eventually allow leaf growth, life and the universe. The internal wood enclosed by the cambium layer becomes relatively very unreactive. A question is, what is the optimum mass of cambrium layer relative to the needs of the tree? If it is too thin, undernourished. If it is thicker than normal, I can only guess why; it might be covering a wound of have other anomalous purposes. As the tree slows to its mature maximum, one can envisage that the cambium layer can optionally be thinner because its transport needs are less and its radius is near maximum. Factors such as these are in implicit in Steve’s formula, but whether it covers all cases and whether it can be made quantitative, I do not know. It is vey hard to quantify the life cycle of a single tree in an artificial, sealed housing with mass balance capability, but it has been attempted. Key word phytometer, which comes with and without root measurement aids. There are strip bark trees in Australia too. Aborigines took slabs a few m long from up to half the girth of a tree, sealed the ends and had a canoe. Many of these trees have survived hundreds of years since. Now, in a case like this, the remaining cambium not stripped off has to take over the job of supplying rather more nutrient than before. It can do this by thickening all over in the next growth season and by trying to expand sideways to cover the removed section. Often, the edge of the wound will show a quite thick bump layer. Often, the wound will never heal. I am at a complete loss to imagine why a dendrochronologist would deliberately select a deformed tree to study. Any suggestions? Incidentally, and just for general gossip, one can cut a tree completely off at its base and then insert a tiny piece of a similar or same species, sometimes even of the same genus, into the cambium layer. (“Cleft grafting”). All going well, the top “scion” will grow as if it was planted in the ground, except it does not develop roots. It uses the roots of the stock plant onto which it was grafted. In time, the scion can grow to the same diameter or more than the stock and the bark cover can become complete. You have to look hard sometimes to see the join. But the join is not between the interior wood. Its strength comes only from the outside growth that happened after the graft. I mention this because virtually all of the botanical properties of the resulting plant reflect the scion that was added and not the stock that had its head cut off. It follows that if a single horizontal chop was made into the side of a whole tree, the tree rings above and after the chop would be disturbed in a way that might defy easy reconstruction. There is a matter to ponder about how small a wound affects the upstream ring pattern. Why use strip bark pines? As I said above, it depends on your purpose. Older trees are more likely to have suffered bark stripping. If you want the oldest trees, you are more likely to have to limit your purpose to something that is compatible with such challenges. Pure ring counting is certainly compatible. We are seeing some good discussion here about “proof” of whether dendroclimatology can in any way be based on strip bark trees. Thank you. I carefully read all that has gone before including your comment and I have looked at the results coming in. Perhaps the added parameter of bark damage will enrich the data, perhaps it won’t. Personally, I try at first blush to control as many variables as possible in experimental design. Did you find any rail spikes driven into the trees by Greenpeace protesting against sawing? Story: I volunteered to test a new drug for migraines (yes, double blind, if you are a migraine sufferer). When I said I had a pacemaker I was out of the study because the organisers said it would be bad for their stats if a test subject died on them. It’s like choosing sick trees for dendro studies when there are less sick ones. Personally, I try at first blush to control as many variables as possible in experimental design. Exactly. The more I look at other studies, the more amazed I am at the emphasis on mathematical analysis of collected measurements, while shying away from physical interpretation in the field. The data has far more meaning in the field than in the lab. I now have exactly one experience with this process. Lesson learned: in the future, if strip bark trees are really necessary, I would want to “map” the bark on each tree sampled, at least in general, and identify the core locations. It seems obvious that ring widths are related to the history of bark condition on the tree. I haven’t exactly seen such material in published studies. It may be possible to go back and collect that extra data for these samples. Not sure… but perhaps it can be done. I’d love to do it sooner than later, but we’re closing in on winter, so it may have to wait until spring. So, this is like a quantum physics thing, right? By measuring the object’s characteristic you have irreparably changed it’s outcome. So does this throw out all dendrochronology conclusions? Either everyone knows the answer, or no one does, which is why no one has answered. It is related to phyllotaxis- a process by which leaves on a stem are displaced from one another in such a way as to reduce mutual shading. A common arrangement is the 5/2 displacement where each successive leaf is displaced by 144 degrees from the previous. Thus there are 5 leaves for every 2 complete 360 degree turns. In trees branches often form in the axils of old leaves. Nothing spooky here, unlike the continued belief in the mysterious properties of certain trees to act as global thermometers. Congratulations, Steve, on striking another blow for evidence-based science in this debate. Well, the reason for the spacing is easy enough, but the question is how this is done? I believe that generally speaking it’s a function of the concentrations of certain plant hormones. I suspect any PhD plant botanists around could rattle off the details but basically the old leaf stumps would produce one hormone creating a field of varying concentrations as they overlap while the growing tip of the tree would produce another hormone. One of the hormones would have a negative affect (probably he growing tip) and there would likely be some light sensitivity as well. The net result would be to activate only certain old axils to become new limbs and in pines, they’re also induced to grow out rather than up. I seem to recall reading that there’s also a hormone released by the root system of pines which prevents cone formation so that only when the tree gets tall enough to dilute it sufficiently will it start creating pine cones, and then only in places where the concentration is low enough like on the end of branches or on the highest branches. You are gonna have a very difficult time finding a nice well-formed tree that has lived THOUSANDS of years. Can you imagine what those trees have experienced during all that time? What have the trees experienced in all that time? We know from the Global Warmers and Al Gore that the trees lived all their lives in perfect mild temperature, the rains that nourished them were gentle and provided them with exactly the right amount of water, the soil was the perfect chemical mix, and the winds were always gentle breezes that never twisted them and of course, the never had to endure hail or lightning. Only after evil man started to spew carbon dioxide and SUVs roamed the land did they become twisted and gnarly. After all, the climate was perfect until modern man and civilization screwed nature up. You hit the nail on the head here, it will be incredibly difficult. All the more reason to take dendroclimatology with a large pinch of salt. IIRC, I don’t think there are any trees with more than 1,000 rings which aren’t strip-growth trees. On the ancient “well formed” trees, this may be true on mountaintops, but it sure doesn’t seem normal off the ridges here in Washington. The Douglas Fir isn’t normally “thousands”, but these suckers are amazingly regular even after 500 years. I’m sure there are blemishes, and ‘scabs’ over previous damage, but the ground-level bark is astonishingly unblemished in the vast majority of the 3+ foot diameter Douglas Firs. I’m not a biologist, so I’m guessing that I’m talking about the “Coastal Douglas Fir” which is extremely common in the Cascade and Olympic Mountains. 500-to-1000+ years is nothing to sneeze at. #62 & 63, this leaf spacing reminds me of tree suckers, you know the odd branch growths that come out of the trunk below a main branch of a tree which landscapers/tree trimmers cut off for aethestic purposes. I assume this is somehow related to what you are talking about. Which brings me to the next question, isn’t the tree ring width also affected by the proximity to branches? So taking any ring cores near a surface knot or sub-surface knot is going to play havoc with the nominal ring width? I think someone mentioned knots before. Svensmark and Friis-Christensen say baloney. It appears that the matter still is not settled, by any means. By all means, snip if you deem this inappropriate. 70, 71: I think the reason they don’t bother with those trees is that they are not “temperature limited,” meaning that every year the temperatures are optimum for growth. You have to go to treeline to find the trees that exhibit temperature-controlled growth. RE: #77 – BCP may actually be CO2 limited in terms of upper elevation limit. Get low than a certain atmospheric pressure and plants simply cannot photosynthesize very well. Ever notice how in the tropics, you get into scrubbier and scrubbier looking plants as you go up in elevation, until you are down to sedge forms, well below elevations where it gets seriously cold. Around Everest and K2, things are just completely barren in all directions up in the real mountains. You even see a hint of this in the spur ranges in South China, Burma and Thailand. The real question, then, is not why dendrochronologists would collect such data, but why would dendroclimatologists use it? ( The lord of the rings) use Hemispherical climate data. 2. What does a 600 year BCP say about Norwest climate. Can you help with a last-second trip up Almagre to refine some of our data? The weather tomorrow looks good. Windy (50mph gusts) but warm enough to go back up one more time. My goal: collect more detailed photos, and more accurate angles, slopes, bark coverage, etc. Three “items” would be VERY helpful. Anyone in the Colorado Springs area able to help with any of these for tomorrow, Saturday October 20th? 3) An ATV to borrow for the day. Would make the last part of the trip much easier. OK, so why didnt the Dendrochronologists ever marry? Because he was too interested in tree cores? No.. I think the real reason is that he only dated trees. #78. Graybill’s agenda was to prove CO2 fertilization. HE coauthored a paper with Sherwood Idso. It is one of the supreme ironies of the hockey stick that it depended on the same trees that were used to demonstrate CO2 fertilization. It increasingly looks like both “proofs” were faulty and that what they were really picking up were just strip bark mechanical anomalies. A large proportion of trees pictured seem to me have been victim of lightning strike. Evidence being number which have been split clean in two, and a number which have grown forked, but where I think I can see evidence of healed split eg. in tree second from left post 71. Tree to left of tree 31 seems to be younger than tree 31, but has grown taller and straighter. Seems to me that lightening strike leads to greater girth as opposed to height. Older trees are more likely to have been struck by lightning, and therefor more likely to have had growth influenced by lightning damage as opposed to other limiting factors like temp or water. In general looking at all the tree picture, I was struck by the lack of uniformity of height, girth, and general overall dimensions. I have seen pictures of Redwood forests in the US, or pine forests in Europe were the trees were all very similar. The trees are sometimes in groups, sometimes isolated. The isolated trees must be in locations where existance is marginal, otherwise others would have grown nearby. Overall, I think that the selection of this type of tree, in a location where lightning strike is endemic, and where some of the sustaining factors must have been marginal for a long period of time. is a very poor choice for using tree ring growth as a proxy for temperature, aside from all the reservations already expressed. A possible proof of that would be some kind of cross correlation between trees. If they don’t correlate highly between themselves, shouldn’t they be ruled out? Might be OT a bit, but then if you have a missing branch you might be able to get an idea of where it was. Long shot, though. I have a half dozen published papers on the subject and knew one of the cutting edge scientists, a physicist, the late Dr John Rouse, from Melbourne Uni. Try “Basis for Synthesis of Spiral Lattice Quasicrystals”, Bursill L.A. et al, Modern Physics Letters B, Vol 3, No 14 (1989) 1071-85. I have a feeling that the 5/2 displacement is no longer supported by evidence, and I do not know of proof that maximum shading is the reason for the geometry. Mention is often made of phyllotaxis in sunflowers. The “spooky” parts are (a) that the flower starts growing from the inside, yet later the outer seeds become separated by the magic angle and (b) the count of left-curving and right-curving parastichy is USUALLY two consecutive Fibonacci numbers – but sometimes a Lucas series is implicated. How do trees know math? In the case of snowflakes/dendrites, of course it’s math/chemistry/physics. Biology’s a bit less predictable.